Collagen is the key structural protein that ensures the cohesion, elasticity and regeneration of our connective tissues, including skin, tendons, cartilage, ligaments, and bones. basically its the glue that holds us together, and in fact The word collagen comes from the Greek word for glue. As we age our collagen production reduces, and our body starts to fall apart, so we can benefit by consuming collagen supplements. Its used to support the health of Skin, nail, hair, bones, and tendons, and can be beneficial to athletes, the elderly or those with arthritis. How does taking collagen improve skin? Collagen is an important building block of the human body. 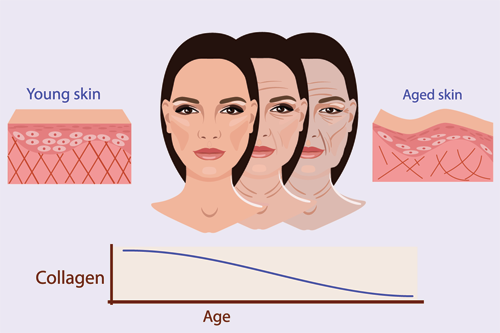 As we age, the body produces less collagen. One of the things that starts to deteriorate first due to insufficient collagen is the skin. This breakdown can be reversed by taking collagen. Click the button below to add the Collagen C to your wish list.